Last week QR Pay Ltd got in touch with me to let me know they had just released their new app ‘QR Pal’ and that it was a QR reader with a bit more functionality than the average application. Intrigued, I have spent the last week playing with it to give it a test. To start with you have to create an account, which given how often people change their phones these days, helps you to keep track of your QR Codes that you have scanned. 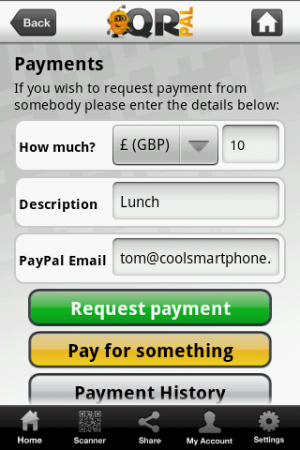 This brings me neatly into the first of this apps handy feature, the ‘Wallet’. Here you can see that I have previously scanned a QR Code that QR Pal has recognised was for an app on the Market and it’s stored it for me. This is where the app gets a little social and it allows me to share the code with others. I can send it via MMS, Email or share it across twitter, facebook and Linkedin. You have to authorise each account, and I’ve had a little trouble making the twitter account work, but I have managed to post to facebook. I have a little bit of a gripe with that, it seems like everyone is integrating social networks into everything these days. My news feed is full of my friends various apps automatically posting inane updates. I’ll agree it serves a purpose here, but I found you only reap the benefits after you have built yourself a decent catalogue of saved codes. The final little addition I want to talk about is requesting and paying for money. Using this interface you create a QR Code that, when scanned, takes you directly to paypal so that you can transfer some money. 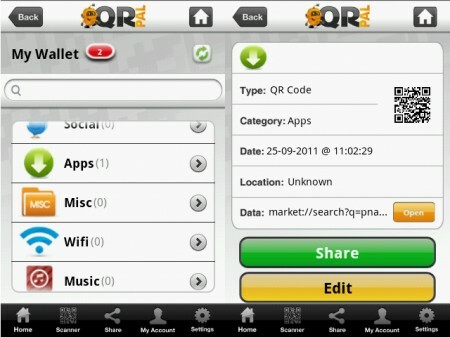 You can pay, or request payment from someone else with the web browsing portion handled by QR Pals own built in browser. I am not sure how much of a useful feature this really is, and it obviously lends itself to this work we seem to be heading towards where no one carries any money any more. However, we are not quite there yet. So what’s the final word on this little app? It’s definitely very well sorted and properly implemented, I can’t fault it for the job that it is designed to do. The problem here is the competition it has to face in this section of the market, can it run with the likes of Google and go up against it’s ‘Goggles’ app? It definitely has the upper hand with the way it sorts and stores the codes you scan, that’s very clever. As a stand alone QR Code reader I’d recommend you download it, especially if you are like me and enjoy a good bit of social networking. I know I have a lot of friends with smartphones who have the ability to scan these codes I will share around, and that number is increasing. You can find this app on the market here, it’s free so why not give it a go.